The 503 service unavailable error indicates that the server hosting the website you are trying to access is unavailable. In March 1989 a British computer scientist Tim Berners-Lee, who was working at CERN at the time, came up with the idea for what later became the World Wide Web. HTTP is the protocol that powers the web by allowing one computer (the client) to send a request to another computer (the server) and get a response. When you type a website address into your browser’s URL bar, it sends a request to the server on which that website is hosted, and then the server responds by sending your browser data that allows it to display the website. A status code is a three digit number provided by a server to the client together with a short description of it known as a reason phrase (it may or may not be shown to the user depending on whether the situation requires the user’s attention). 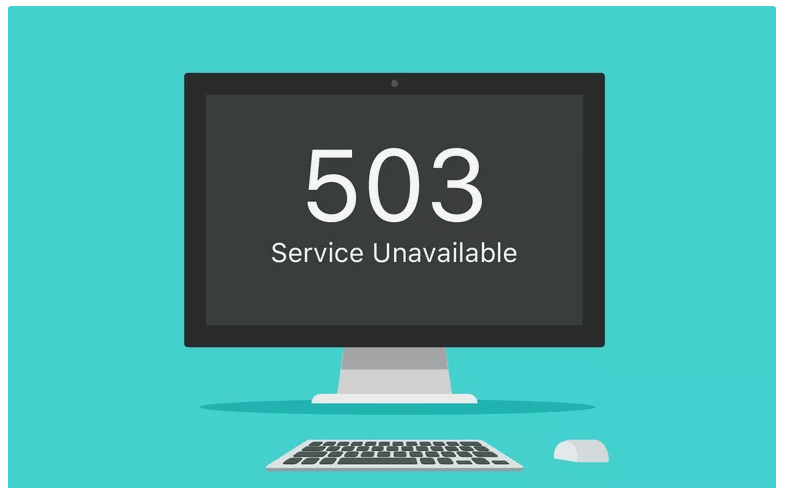 “503” is a status code that indicates a particular server side error and “service unavailable” is the reason phrase that describes it. Remembering that 4xx codes show that the problem is on your side and 5xx codes show that the problem is on the other side is useful because it allows you to immediately know whether there’s anything you can do solve it. This can save you a lot of frustration. 503 service unavailable message is shown to the user when the server they are trying to reach is unavailable. What are the most common causes of this error? Server is down because of a spike in traffic. An unexpected and sudden increase in traffic to a website, such as an article going viral on social media or a product being featured on a major publication, can crash the server on which that website is hosted. Server is down because of maintenance. Servers need regular maintenance in order to work properly. That means they are occasionally unavailable for this reason. Server is down because of a DDoS (Distributed Denial of Service) attack. DDoS refers to someone deliberately overwhelming and crashing a server by bombarding it with requests. Generally, when you encounter the 503 service error, there’s not much you can do about it. Your best bet is to wait for the server to become available again. Although 503 service unavailable error is a server-side error, sometimes the problem might actually be on the client (your) side. This can occur when the DNS configuration on your router or on your computer is preventing you from accessing the website. This is rare, but if you suspect that to be the case, you can simply restart your internet router and the computer and then try accessing the same website again.